Hot on the heels of the offical trailer we gave you a few days ago comes the extended and restricted trailer for catacombs horror - As Above, So Below. The film stars Perdita Weeks (Prowl, The Invisible Woman), Ben Feldman (Friday 13th, Cloverfield), Edwin Hodge (The Purge), François Civil (Frank) Marion Lambert, Ali Marhyar (Zero Dark Thirty), Cosme Castro and Hamid Djavadan. It is directed by John Erick Dowdle who co-wrote the film with Drew Dowdle. 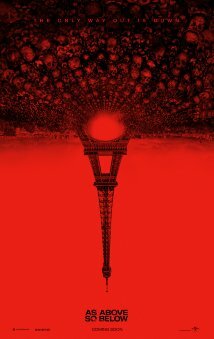 As Above, So Below is released in UK cinemas on 29th August 2014. Miles of twisting catacombs lie beneath the streets of Paris, the eternal home to countless souls. When a team of explorers ventures into the uncharted maze of bones, they uncover the dark secret that lies within this city of the dead. A journey into madness and terror, "As Above, So Below" reaches deep into the human psyche to reveal the personal demons that come back to haunt us all.